Daventry Under-15s travelled to Buckingham for a friendly fixture, and were beaten 15-5. As the overnight frost cleared, it was obvious that the already muddy pitch would churn up quite badly. With the challenging conditions the same for both teams, it was the hosts who first recognised the importance of just keeping the ball in the forwards whilst slowly gaining small possession gains. From a strong platform, Buckingham took a direct route and targeted a Daventry defence that was still warming up in the changing room. 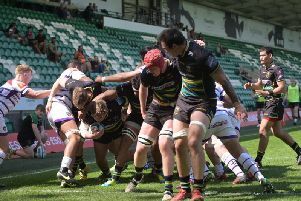 A second try for the hosts followed further forwards pressure and then a third, just before half time, once again exploited a Daventry team who had left their normally impressive defence at home. At half-time Buckingham were 15-0 ahead. The second half was a completely different story as Daventry got to grips with the appalling conditions. Buckingham’s defence held firm as the game resembled more of a game of ‘It’s a knockout’ than a game of rugby. In a morning where neither sets of backs could play any role, Daventry finally managed to slap the slippery bar of mud coated soap out to the wing where Charlie Swallow scored despite some strong defensive work.